Just to give you some idea of what these columns are doing, Columns S is where we re-scale the raw marks to a new average and standard deviation. 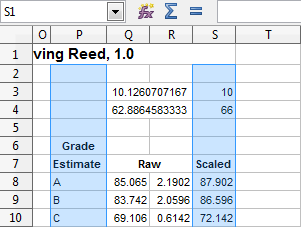 That’s what Cells “S3” and “S4” are used for, the values written there determine the column of scaled scores. You could quite feasibly write a formula using IF statements to include those ranges, but then what if you wanted to change the range to produce more accurate grades? I will show you a method that involves looking up the grade from a table. Firstly though, let’s finish off Column S.
A “Z-Score” tells you how many standard deviations your result is away from the average. With this in mind, we simply need to use all that information to generate a new score. Since Information Technology is primarily about problem solving, this is the perfect opportunity for you to do just that. If you really get stuck, ask questions! You’ll notice that there isn’t a value that exactly matches the raw score of 85.065 but what VLOOKUP does is match the lookup to the highest value it did find, so in our case it would return the values in Row 6. And there you have it! The structure and content of our Spreadsheet is complete. If you try deleting some rows of data from “gv” you should see the “Summary” sheet automatically readjust formulae to reflect the data it has…excellent! We’re not quite done though…it’s time to make sure this sheet looks presentable and can be printed on one page! Where does the 10 and 66 from cells S3 and S4 come from? are you simply giving us these details or should these have been calculated some how? They are an example Average and Standard Deviation. 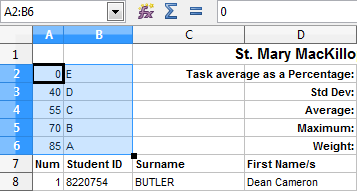 Those two values are essentially available for the user of the spreadsheet to enter the expected Average and Standard Deviation for this sheet. So 66 and 10 are just an example…if you change it, your whole standardised column should reflect those alterations.